“BIOPEX-R” is calcium phosphate cement which consists of powder and the liquid components. They are mixed in the operation room to deliver with an injector or by manually molding. It reaches compressive strength as high as 80 MPa in 24 hours after implantation. As a result, reduction of ambulation time and improvement in QOL (Quality of Life) are expected. 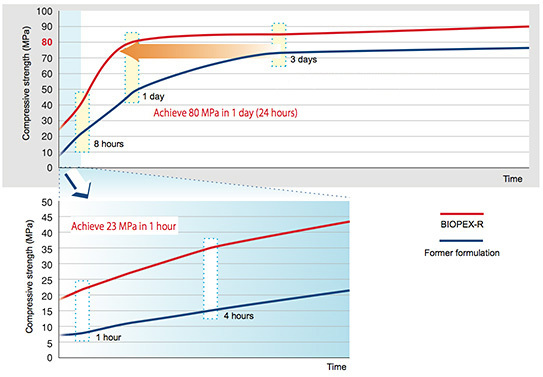 BIOPEX-R achieved 80 MPa in compressive strength in a day. 2. Easy handling with enough injectable time to deliver. Operability was improved by extending injectable time.